Police in Northern Ireland are stepping up patrols and increasing check points in a bid to counter the dissident republican threat. Dissidents have been blamed for a spate of recent attacks including the discovery of two partially exploded bombs at an Army reserve base in Londonderry yesterday. 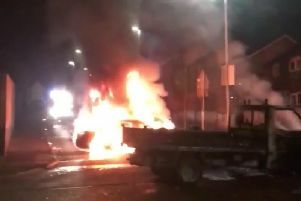 Last week, police in Belfast escaped injury when a blast bomb type device was thrown at their vehicle and detonated in mid air. Assistant Chief Constable Stephen Martin described the threat as “severe”. He said: “This is not a decision we take lightly and we will endeavour to ensure that the balance of how we police this threat is right, as well as trying to keep disruption to a minimum. However, please be assured we will always prioritise public safety. Dissident republican extremists, opposed to the peace process, have been responsible for the murders of two soldiers, a police officer and a prison guard in recent years. A group calling itself the New IRA is also believed to have been behind a number of other vigilante-style attacks. Security sources say the groups are small in number, have little support and are heavily infiltrated. A number of attacks including a mortar bomb bid on Londonderry’s main police station have been thwarted.